2D Animation 101's CrazyTalk Animator 3.1 course. Presented as a series of video tutorials, instructor Mark Diaz, takes you through the entire process of scripting, storyboarding, and creating scenes using your own custom characters (created in Photoshop) with the focus, specifically on scene creation and the animation process in CrazyTalk Animator. 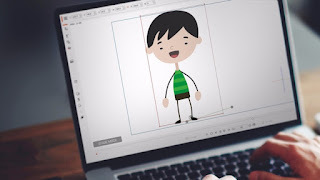 The course does not teach you the entire application of CrazyTalk Animator, Instead it teaches you enough to get you animating to a fairly professional standard with your own character designs. The intention, as the course title states, is to teach you enough about the software to begin creating your own animated series, for your own YouTube channel. At the same time, all through out the course, Mark makes a strong case for why CrazyTalk Animator is the ideal software for creating a 2D animated series for YouTube, demonstrating how much faster the CTA work flow can be at almost every stage of production. Having completed the course myself I was impressed with Mark's enthusiastic presentation and easy to understand explanation of each process. Each lesson is fairly short, with most being under 10 minutes in length. You are never given so much information as to feel overwhelmed or too little information that you're wondering why that lesson warranted its own section. Whilst the course is aimed at beginners, as a long time CTA user, I still learned a few better ways to do things and discovered some things I didn't know. Particularly within lessons centered around newer features released in version 3.1 of the software (I'd highly recommend this course if you are transitioning from CTA2 to CTA3 as it specifically teaches many of the newest updates). The video below gives you a more detailed over view of what you'll learn and I highly recommend it as a worthwhile investment. The entire course is short enough that you could easily binge watch all the lessons in a day or two but structured so that it's easy to find and rewatch anything you didn't absorb the first time through. In fact I've found myself referring back to specific lessons any time I need a quick refresher on a particular process. If you're interested in CrazyTalk Animator 3.1 but have yet to purchase the software, Reallusion currently has a special promotion where you could win one of 500 copies of CrazyTalk Animator Pro. Click here for more information.